It is both a pleasure and a great workout. It helps you stay in shape, enjoy the outside and maintain your health. For every tennis enthusiast it’s even more than that. It is about passion and love for the game. An exiting sport, a way of living, that has so many things about it yet seem so simple. But both new and veteran players know what a mess can be having tennis balls laying all over the place. And picking them up is just a tedious chore. It won’t ruin your game but it is definitely a nuisance. This is where innovations come into place. And that’s why we have tennis ball hoppers which are designed in such a way that you can pick up the balls without leaning down and then just use the balls from the basket. They have good capacity and can hold a lot of tennis balls, after all you don’t want to go around the court taking tennis balls every few minutes, right? 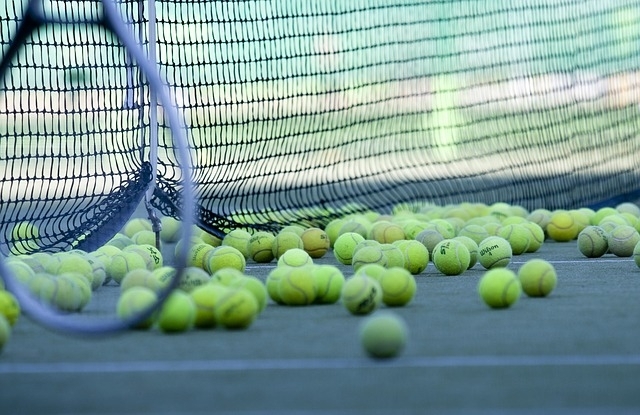 Let’s take a look at what are some of the best ball hoppers for tennis. This tennis ball hopper is ideal addition for the tennis court. You can pick up the balls by just placing the basket over the ball and pushing down. It offers spacious place – enough to hold about 75 balls. And the tennis ball basket has handles that convert to lockable legs. It has sturdy constriction good built quality and a lid that will keep the balls in place. The Wilson ball hopper is made of lightweight graphite which is great as it is making the hopper easy to carry and use. It requires some assembly (the tools are included in the package). This ball hopper, has good capacity, it can hold up to 85 regular tennis balls. It is build with sturdy materials and it is heavy duty. It can last for long time. It has fixed handle and no moving parts. It has heavy gauge steel wire and black powder coated finish that is made to last. A very sturdy and durable basket for picking up tennis balls that is made with the idea to last and make any tennis set a lot more easier. This item can hold up to 80 balls. It is very easy to use and move as it has wheels. It is also very lightweight weighing at only 4.5 lbs and it is made with durable construction. It’s made of re-enforced polypropylene. No wires that can rust with time or paint to peel. There is patented technology for easy lifting up of balls. The sliding bars close at the top for quick and secure closure and the balls will not fall out of the basket. It stands 33.5 inches high. It looks good, and is affordable option for every tennis enthusiast. This ball hopper can hold up to 110 tennis balls, it is good option for keeping organized your tennis balls while you play. The accessory is good idea for any tennis player alike; teachers, parents and kids. It is build with high quality materials, it is also weather resistant which is great for longer usage outside. The design is good for storing the tennis balls. It is easy to carry and easy to be used in general. It has handles which are flipped over for better convenience. The pick-up tool comes with attached lid for preventing spillage and keeping the balls in the basket. A very easy to use ball hopper with good design and functionality, sturdy materials and at good price.